Twenty years ago my first book was published. Torrie and the Dragon came out from a Canadian children’s publisher called Roussan in 1997. It was shorter and had less depth than I would have liked, but in Canada, kids’ books were often quite short. I think of it now as something long ago and far away, but when I go back and look at it, I realize it was not bad at all. I quite like it still, especially the humour of Torrie’s narrative voice, which has echoes of Milne, Lang, and the like, I think. And one thing it had, which the publisher of the later Torrie books wanted cut, was the framing story of what I called the peanut gallery — the crowd of sometimes restive animals and Old Things in the Wild Forest to whom Torrie was telling his adventures. I wrote it when I was twenty, in eight days, during my father’s final illness. It’s the only eventually-published thing of mine he ever got to read, though it didn’t find a publisher till I was twenty-nine. A young enchantress gets fed up with her sorcerer father turning captured trespassers into wolf-headed guards, steals the latest victim from the dungeon, and sets off with him to slay a dragon and save his kingdom, all accompanied by Torrie, small and furry, ancient and wise, oldest of the Old Things of the Wild Forest. 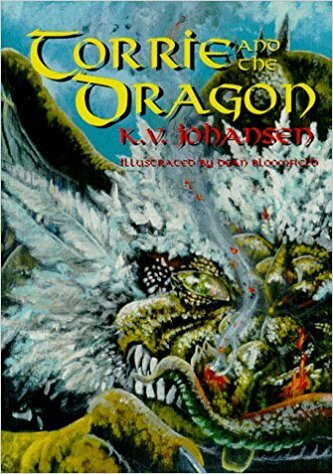 This entry was posted in Torrie, Twenty Years of Books and tagged adventures, Canadian children's authors, children's fantasy novels, dragons, middle grade, Torrie books. Bookmark the permalink.